A 4D Simpsons attraction is set to open on August 17 in South Carolina, US. 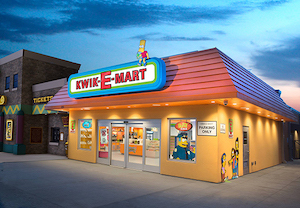 The iconic Kwik-E-Mart from the hit animated show will be the first phase of the project with the Aztec Theatre slated to premiere later in the year. The attraction is located at Broadway at the Beach, a shopping center and entertainment complex in the resort area of Myrtle Beach. Once open, guests may visit the immersive, fully themed convenience store which sells a wide array of recognisable products from The Simpsons, including Buzz Cola, Heat-Lamp Hot Dogs, Lard Lad Donuts and show-inspired Squishee flavours. Alongside these, the Kwik-E-Mart offers a variety of food and beverage options, as well as unique Simpsons merchandise. The Aztec Theater is set to premiere later this year. This ticketed attraction includes a fully themed lobby and theatre experience rich with detail. Guests join Homer, Marge, Bart, Lisa, and Maggie in a new 4D Experience adventure. Included in all tickets will be a Hollywood premiere-style souvenir photo and after the 4D Experience, guests are free to explore the Kwik-E-Mart.